Birdsong is a mesmerising story of love and war spanning three generations between WW1 and present day. 1910. Amiens, Northern France. Stephen Wraysford, a young Englishman, arrives in the French city to stay with the Azaire family. He falls in love with unhappily married Isabelle and the two enter a tempestuous love affair. But, with the world on the brink of war, the relationship falters. With his love for Isabelle forever engraved on his heart, Stephen volunteers to fight on the Western Front and enters the unimaginable dark world beneath the trenches of No Man's Land. 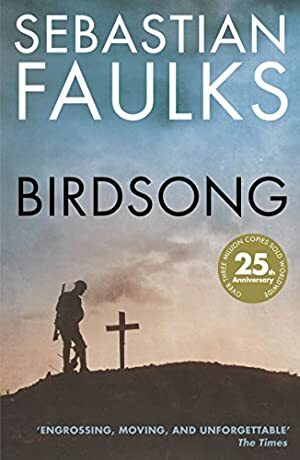 From award-winning writer Sebastian Faulks, Birdsong is an exceptionally moving and unforgettable portrait of the ruthlessness of war and the indestructability of love. Log In to track Sebastian Faulks on eReaderIQ. to be notified each time the price drops on any book by Sebastian Faulks. to stop tracking Sebastian Faulks. We started tracking this book on February 18, 2011. This book was £4.06 when we started tracking it. The price of this book has changed 149 times in the past 2,988 days. The current price of this book is £4.99 last checked 53 minutes ago. The lowest price to date was £1.99 last reached on April 14, 2019. The highest price to date was £6.35 last reached on April 23, 2015. This book has been £6.35 one time since we started tracking it. We last verified the price of this book about 53 minutes ago. At that time, the price was £4.99. This price is subject to change. The price displayed on the Amazon.co.uk website at the time of purchase is the price you will pay for this book. Please confirm the price before making any purchases.